No more dependence on IIS - AD FS is now built directly on top of HTTP.SYS and does not require the installation of Internet Information Services (IIS). Logo and illustration - The logo and illustration of pages can be easily updated and changed with a simple Windows PowerShell PowerShell cmdlet. It is no longer necessary to modify any of the webpage code in AD FS. Customization of standard Links - Most organizations have some notion of standard links for IT support, home page, and a privacy link. These elements can be configured and displayed on AD FS webpages. Customization of web themes - At the heart of the customizations is the notion of a web theme. This feature enables the administrator to customize the entire appearance and behavior of the AD FS pages. Each web theme supports all of the elements that were described previously. 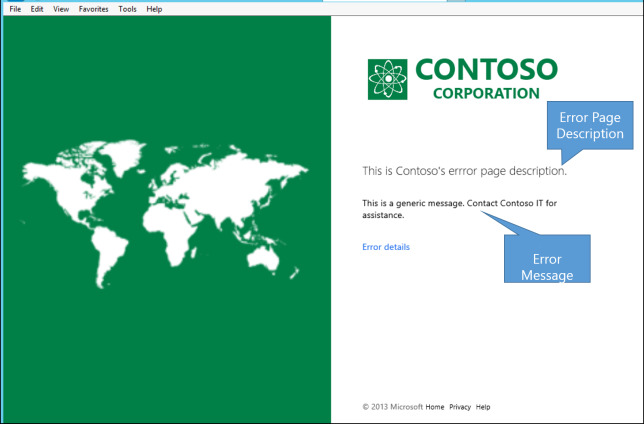 Customization for error pages - When something goes wrong, an error page is displayed to the end user. A few enhancements have been made to provide a better user experience. For example, AD FS now support sending error details to an IT help desk if required by using one click. Customized "Access denied" messages – End users often get confused when they get a generic "Access denied" message. AD FS now supports customized "Access denied" messages to enable organizations to provide customized instructions for its end users. This customization supports HTML content and can be set globally or on the basis of a relying party trust. Responsive design to cater to different form factors - AD FS now supports automatic adjustment of size and positioning of elements through cascading style sheets (CSS). For example, in the smartphone scenario where the form factor is limited in width, AD FS sign-in pages would automatically adjust and also hide the illustration. Improved user experience for home realm discovery –AD FS now supports home realm discovery by looking up organizational account suffixes that a claims provider supports or by looking up the claims provider list that is configured for a relying party trust. AD FS also supports by-passing home realm discovery for intranet access. 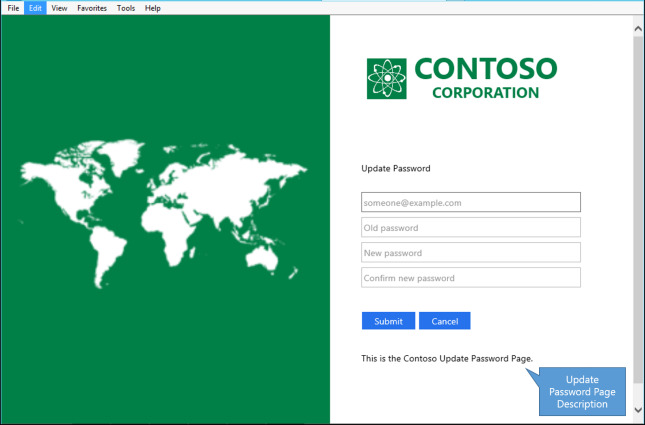 Support for updating the password – Users can change their password without having to connect to the corporate network. 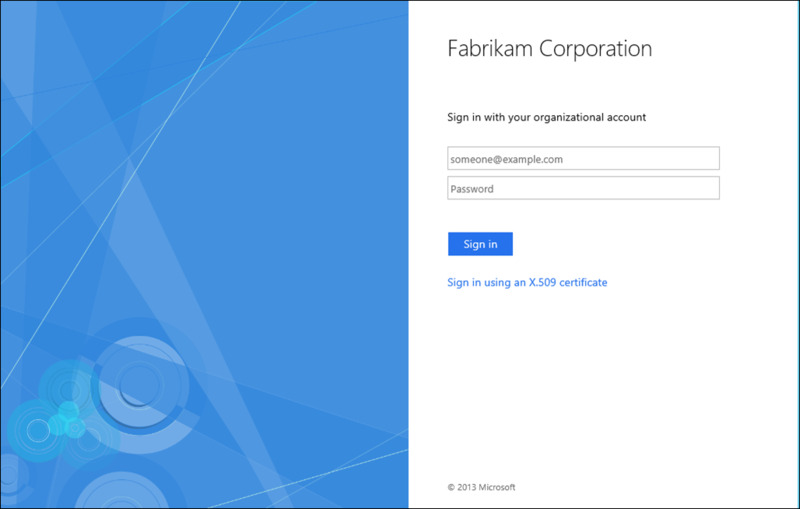 The following topics describe how to customize the AD FS sign-in experience. 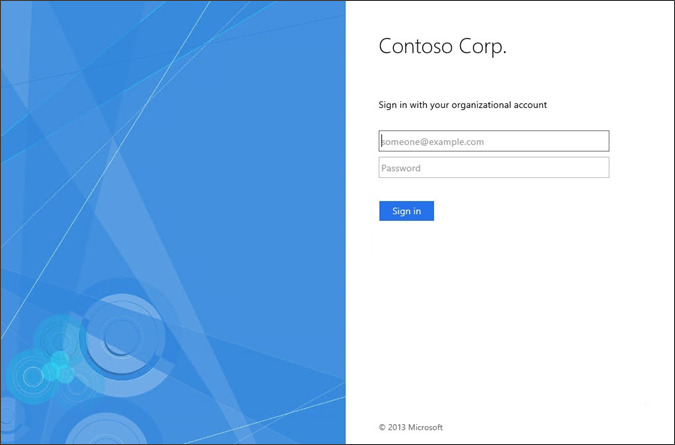 Out of the box, you notice the appearance and behavior of the sign-in experience to be similar to the appearance and behavior that is offered by Windows Azure Active Directory. The name of the organization, which is obtained during setup, is displayed by default. This page, as most of the other pages, can be customized and tailored to your organization’s requirements. The customization includes changing the logo, the illustration, adding additional descriptions, and links. 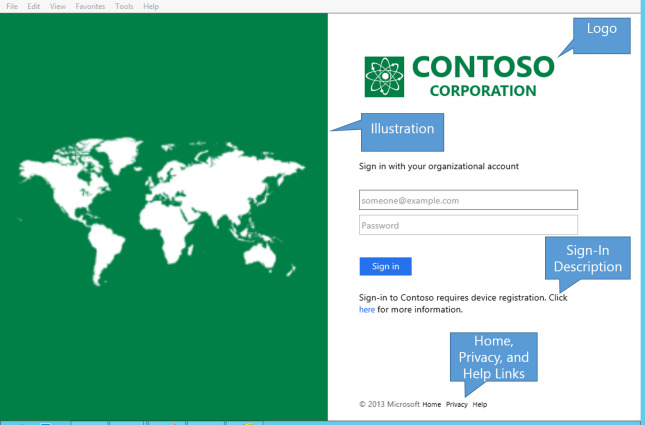 The following illustrations show an example of the default sign-in page and a customized sign-in page. Use the following Windows PowerShell PowerShell cmdlets to modify and customize your AD FS sign-in page. The following is an example of a customized sign-in page. To change the name of the company that is displayed on the sign-in page, use the following Windows PowerShell PowerShell cmdlet and syntax. This value is set by default by using the value from the Federation Service display name that you entered during setup. You can also use the Windows PowerShell Integrated Scripting Environment (ISE) to change the company name. By using the Windows PowerShell ISE, you can display content in a Unicode-compliant environment. For additional information, see Introducing the Windows PowerShell ISE. To change the logo of the company that is displayed on the sign-in page, use the following PowerShell Windows PowerShell cmdlet and syntax. We recommend the dimensions for the logo to be 260x35 @ 96 dpi with a file size of no greater than 10 KB. The TargetName parameter is required. The default theme that is released with AD FS is named default. 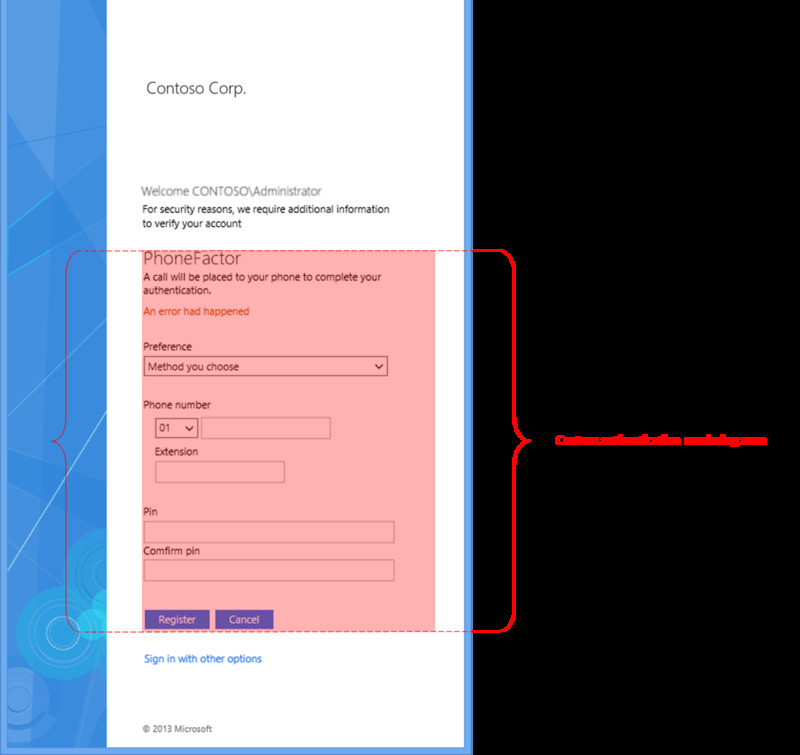 To change the illustration, the graphic on the left, which is displayed on the sign-in page, use the following Windows PowerShell PowerShell cmdlet and syntax. To add a sign-in page description to the sign-in page, use the following Windows PowerShell PowerShell cmdlet and syntax. The string for the SignInPageDescriptionText parameter supports both pure HTML with the tags and without. Therefore, you can also run the following cmdlet without using the <p> tag. 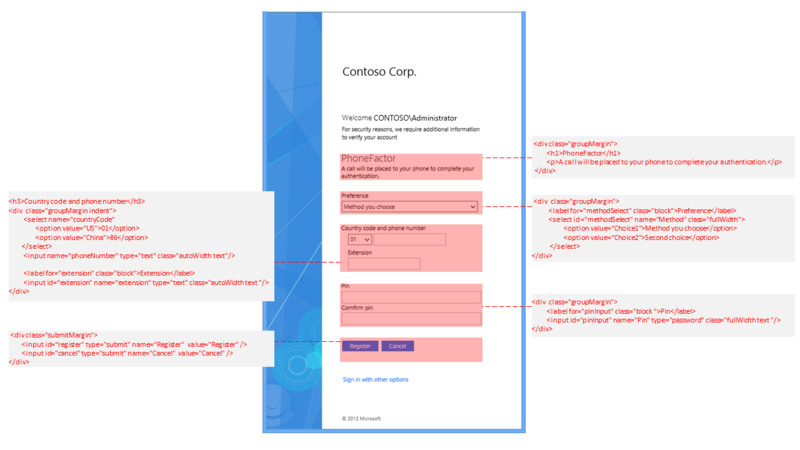 Set-AdfsGlobalWebContent -SignInPageDescriptionText "Sign-in to Contoso requires device registration. Click <A href='http://fs1.contoso.com/deviceregistration/'>here</A> for more information." After the sign-in page is customized, the customization takes precedence; therefore, you should customize for all languages that you want to support. All customized content takes a locale parameter. When you configure localized content, it should be configured with a country-less locale first, for example, "en", before you configure country and region-specific locale such as "en-us". To add the help desk link that is displayed on the sign-in page, use the following Windows PowerShell PowerShell cmdlet and syntax. The linkText parameter in this cmdlet is not required unless you use another value than the default, which is Help. The advantage of using the default is that they are localized to all client locales. After the page is customized, the customization takes precedence; therefore, you should customize for all languages that you want to support. To add the home link that is displayed on the sign-in page, use the following Windows PowerShell cmdlet and syntax. The linkText parameter in this cmdlet is not required unless you use another value than the default, which is Home. The advantage of using the default is that they are localized to all client locales. after the sign-in page is customized, the customization takes precedence; therefore, you should customize for all languages that you want to support. To add the privacy link that is displayed on the sign-in page, use the following Windows PowerShell cmdlet and syntax. The linkText parameter in this cmdlet is not required unless you use another value than the default, which is Privacy. The advantage of using the default is that the pages are localized to all client locales. After the sign-in page is customized, the customization takes precedence; therefore, you should customize for all languages that you want to support. All customized content takes a locale parameter. When you configure localized content, you should configure it with a country-less locale first, for example, "en", before you configure country and region-specific locale, such as "en-us". The theme that is shipped out-of-the-box is called Default. You can export the default theme and use it so that you can start quickly. You can customize the appearance and behavior, which includes the layout by modifying the .css file, import and apply this new theme, and then you can use the customized appearance and behavior. Using the .css file also makes it easier to work with your web designers. The following cmdlet creates a custom web theme, which duplicates the default web theme. You can modify the .css file and configure the new web theme by using the new .css file. To export a web theme, use the following cmdlet. To apply the .css file to the new theme, use the following cmdlet. The following cmdlet creates a custom web theme from a new style sheet. To apply the custom web theme to AD FS, use the following cmdlet. You can configure custom error messages that can be tailored to your organization. The following illustration shows a customized error page description and a generic error message. Use the following Windows PowerShell cmdlets to customize your error messages. To customize the error page description, use the following Windows PowerShell cmdlet and syntax. Set-AdfsGlobalWebContent -ErrorPageDescriptionText "This is Contoso's error page description"
To customize the generic error message, use the following Windows PowerShell cmdlet and syntax. Set-AdfsGlobalWebContent -ErrorPageGenericErrorMessage "This is a generic error message. Contact Contoso IT for assistance." 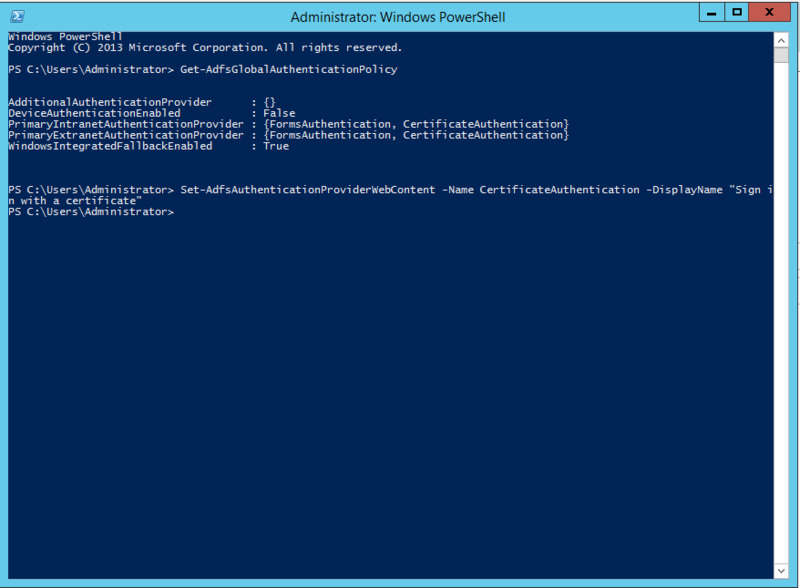 To customize the authorization error message, use the following Windows PowerShell cmdlet and syntax. Set-AdfsGlobalWebContent -ErrorPageAuthorizationErrorMessage "You have received an Authorization error. Contact Contoso IT for assistance." To customize the device authentication error message, use the following Windows PowerShell cmdlet and syntax. Set-AdfsGlobalWebContent -ErrorPageDeviceAuthenticationErrorMessage "Your device is not authorized. Contact Contoso IT for assistance." You can configure a support email address in AD FS. If configured, AD FS automatically shows a link for end users to email the error details. To customize the support email error message, use the following Windows PowerShell cmdlet and syntax. You can configure a relying party authorization error message in AD FS. To customize the relying party error message, use the following Windows PowerShell cmdlet and syntax. When the AD FS client first requests a resource, the resource federation server has no information about the realm of the client. The resource federation server responds to the AD FS client with a Client Realm Discovery page, where the user selects the home realm from a list. The list values are populated from the display name property in the Claims Provider Trusts. Use the following Windows PowerShell cmdlets to modify and customize the AD FS Home Realm Discovery experience. Be aware that the Claims Provider name that shows up for local Active Directory is the federation service display name. An organization can federate with multiple claims providers. AD FS now provides the in-box capability for administrators to list the suffixes, for example, @us.contoso.com, @eu.contoso.com, that is supported by a claims provider and enable it for suffix-based discovery. With this configuration, end users can type in their organizational account, and AD FS automatically selects the corresponding claims provider. To configure an identity provider (IDP), such as fabrikam, to use certain email suffixes, use the following Windows PowerShell cmdlet and syntax. For some scenarios, an organizations might want end users to only see the claims providers that are specific to an application so that only a subset of claims provider are displayed on the home realm discovery page. To configure an IDP list per relying party (RP), use the following Windows PowerShell cmdlet and syntax. Most organizations only support their local Active Directory for any user who accesses from inside their firewall. In those cases, administrators can configure AD FS to bypass home realm discovery for the intranet. To bypass HRD for the intranet, use the following Windows PowerShell cmdlet and syntax. Please note that if an identity provider list for a relying party has been configured, even though the previous setting has been enabled and the user accesses from the intranet, AD FS still shows the home realm discovery (HRD) page. To bypass HRD in this case, you have to ensure that "Active Directory" is also added to the IDP list for this relying party. In some instances, users might not be able to connect to the corporate network to change their account password. This factor can be problematic especially for remote employees who might live far from the nearest corporate office. For these specific cases, the update password page can be used by only connecting to the Internet. You can customize the update password page by providing your own description for the page. This feature is only available for a workplace-joined device. 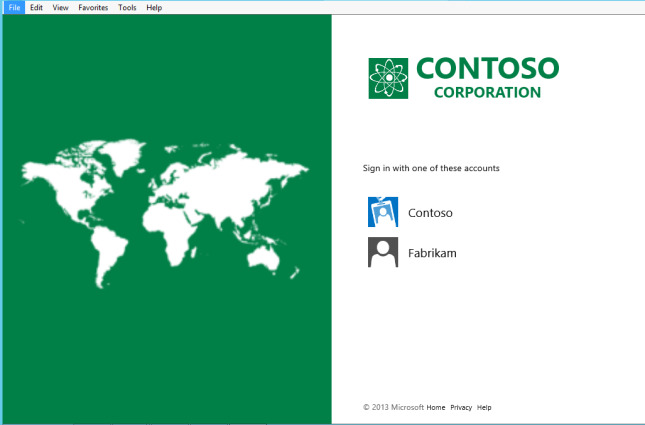 The update password page is only available for Workplace Joined devices and is disabled by default. For more information about Workplace Join and configuring a federation server with Device Registration Service, see Overview: Join to Workplace from Any Device for SSO and Seamless Second Factor Authentication Across Company Applications. To enable the password update page, go to AD FS Management under Endpoints. The endpoint for update password is located at the bottom under Other - /adfs/portal/updatepassword/. Once you have enabled the endpoint, you must restart the AD FS service. This must be done manually. You can then navigate to https://<fqdn>/adfs/portal/updatepassword/ on a workplace joined device and you should see the update password page. To customize the update password page description, use the following Windows PowerShell cmdlet and syntax. Set-AdfsGlobalWebContent -UpdatePasswordPageDescriptionText "This is the Contoso Update Password page." In AD FS, the support for multifactor authentication is provided out-of-the-box. For example, you can configure AD FS to use built-in Certificate Authentication as the second factor authentication. You can also use external authentication providers. This approach can enable AD FSto integrate with additional services, such as Windows Azure Active Authentication, or you can develop your own provider. See Solution Guide: Manage Risk with Multi-factor Access Control for more information about how to register external authentication provider by using AD FS. We recommend that an external authentication provider use the classes that are defined in the .css file that AD FS provides to author the authentication UI. You can use the following cmdlet to export the default web theme and inspect the user interface classes and elements that are defined in the .css file. The .css file can be used in the development of the sign-in user interface of an external authentication provider. The following is an example of the sign-in user interface, which is highlighted in RED, by an external authentication provider. The user interface uses the UI classes in the AD FS .css file. Before you write a new custom authentication method, we recommend that you study the AD FS theme and style definitions to understand the content authoring requirements. A custom authentication method only authors an HTML segment on the AD FS sign-in page and not the full page. You should use AD FS’s style definition to get the consistent appearance and behavior. Be aware that AD FS administrators can customize the AD FS styles. . We do not recommend to hardcode your own styles. Instead, we recommend to use AD FS styles whenever possible. theme styles - These styles should not and cannot be used. These styles are meant to define theme across all pages. They are defined by an element ID purposely so that they are not reused. common styles - These are the styles that should be used for your content. form factor styles - These are styles for different form factors. You should understand this section to ensure that your content works with different form factors, for example, phones and tablets. For additional information, see Solution Guide: Manage Risk with Multi-factor Access Control and Solution Guide: Manage Risk with Additional Multi-Factor Authentication for Sensitive Applications. Localizing web content into languages other than English is possible. Be aware of the following considerations when you localize. After the content is customized, the customization takes precedence; therefore, you should customize for all languages that you want to support. All customized content takes a locale parameter. When you configure localized content, configure it with a country-less locale first, for example, "en", before you configure a country and region-specific locale such as "en-us". The following shows some additional code examples. Set-AdfsGlobalWebContent -ErrorPageDescriptionText "This is Contoso's error page description" –locale "en"
Set-AdfsGlobalWebContent -ErrorPageDescriptionText "Il s'agit de description de page erreur de Contoso" –locale "fr"
If you want to customize the web content to languages other than English that requires the input of Unicode, we recommend that you use the Windows PowerShell ISE. For additional information see Introducing the Windows PowerShell ISE. By default, the AD FS pages contain the Microsoft copyright. To remove this copyright from your customized pages, you can use the following procedure. Create a custom theme that is based on the default. Export the theme by specifying the output folder. Locate the Style.css file that is located in the output folder. By using the previous example, the path would be C:\CustomWebTheme\Css\Style.css. Open the Style.css file with an editor, such as Notepad. Create a custom theme that is based on the new Style.css file. To customize the display names and descriptions for authentication methods you can use the Set-AdfsAuthenticationProviderWebContent PowerShell cmdlt. In order to use this cmdlt, you must first obtain the name of the authentication method you wish to customize. This can be done using Get-AdfsGlobalAuthenticationPolicy. In the example below we see that, on our sign-in page, the following is displayed: “Sign in using an X.509 certificate”. We want to simplify this for our users. So first we get the name of the authentication method and then we edit the displayed text. Now we see that our display message has changed.